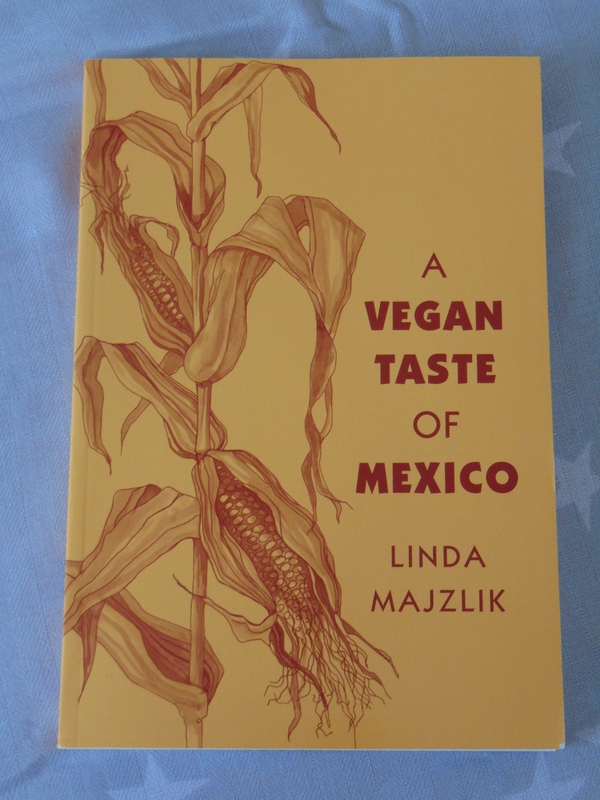 Back in 2015 I reviewed A Vegan Taste of France, part of the series by Linda Majzlik, and now I’ve finally added to my collection with this one. This is a series that never really gets much love, but, two books in now, I’m a big fan! The books are missing some of the touches that make a cookbook easy to navigate (and easy to fall in love with) – no index, no pictures, no hint of the author’s personality – but they are full of reliable recipes, and that’s what really matters. Here’s what I made from this one. This is just the kind of soup I like! 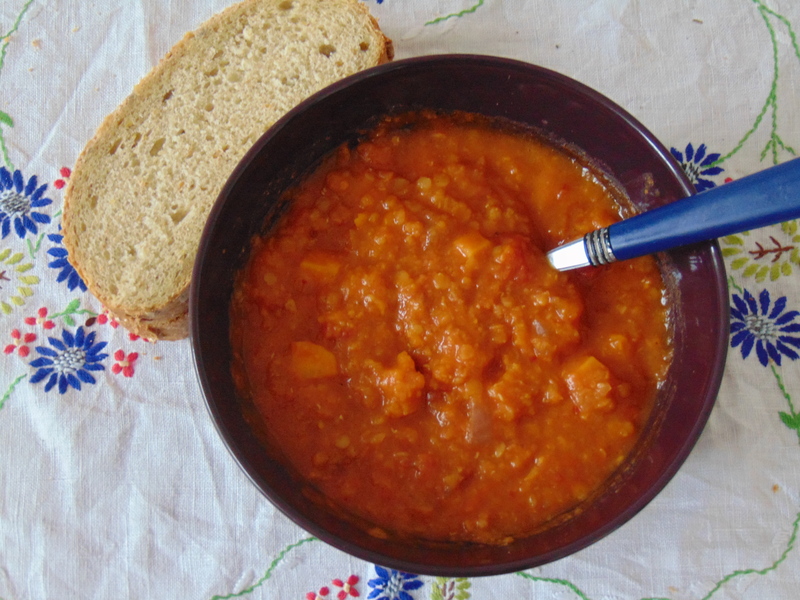 It’s a sweet potato and lentil soup, and it was wonderfully thick and spicy, and extremely filling – the ideal lunch! 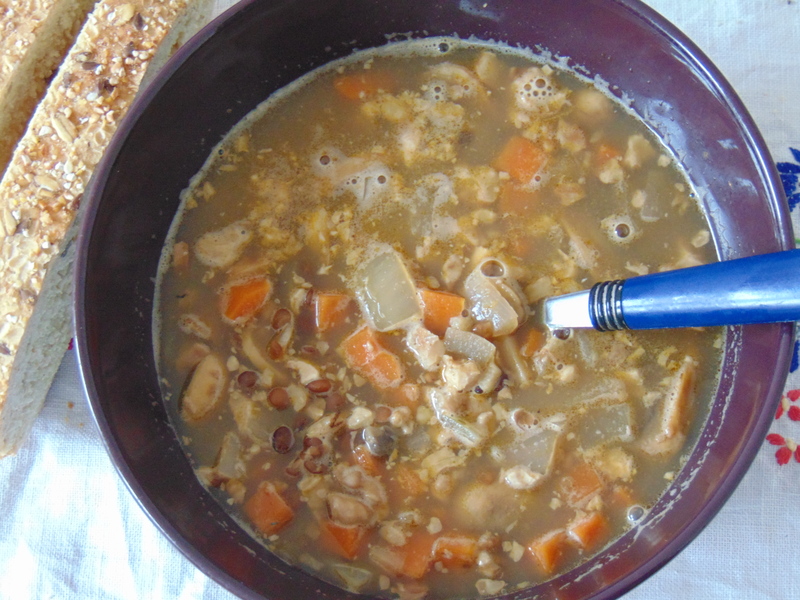 The lentil and bean soup was more of the same – practically a stew! I used a tin of chopped tomatoes rather than the tomato sauce in the recipe, which may explain why mine was so hearty. I was worried that the thinner broth of the brown lentil pecan soup would be a disappointing follow-up, but far from it: it also packed quite the flavour punch, and mushrooms make everything substantial. I chopped the nuts rather than grating them, because life is just too short, surely? I tweaked the sweet pepper, tomato and orange soup a wee bit – I roasted the peppers first, because who doesn’t prefer roasted peppers? I also used a tin of chopped tomatoes rather than fresh ones, and added some stock, as there was none in the recipe (presumably a mistake). 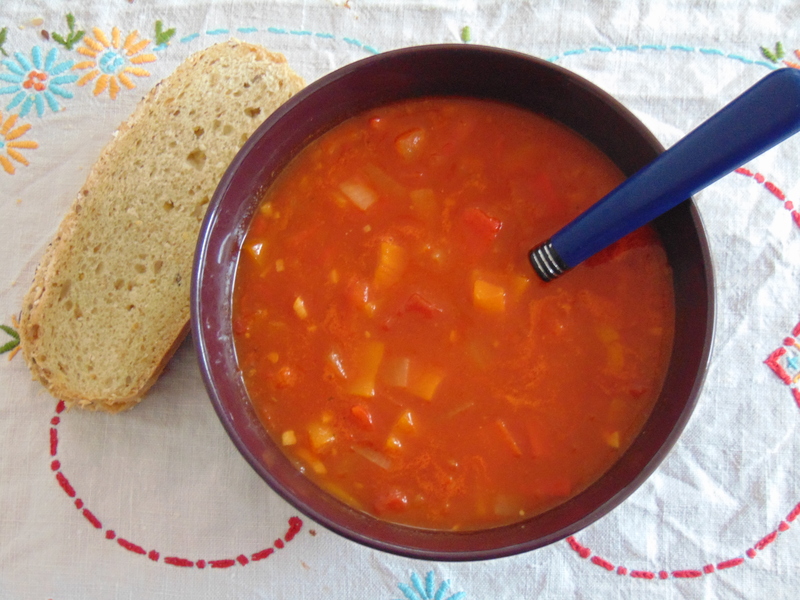 It was such a great soup – really attractive colours, filling, with a lovely sweetness from the peppers and a healthy chilli kick. I’ll definitely make this again. I was a little uncertain about trying the avocado and leek soup because I’ve very rarely had cooked avocado. Actually the avocado flavour was very mild, so I’d probably use two avos next time instead. 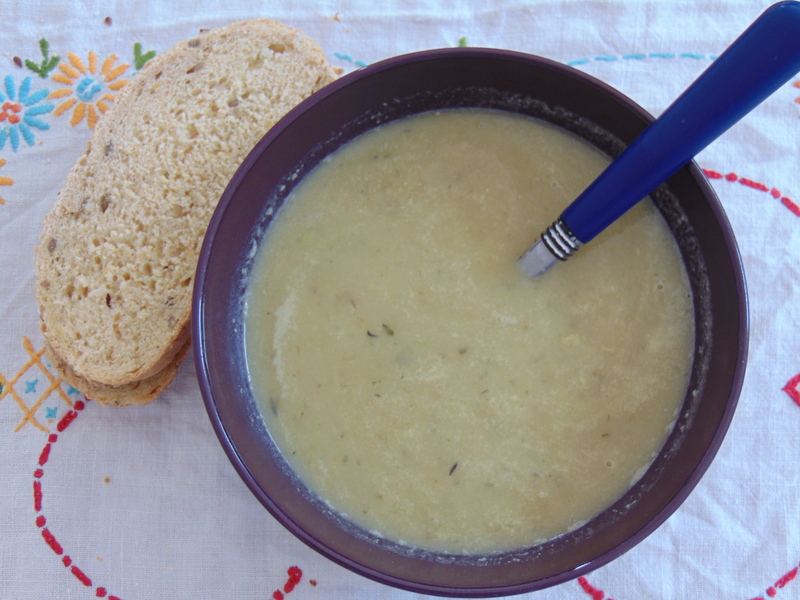 It was a thin soup, nice for spring, but unspectacular. From the light meals section, I gave the quesadillas a whirl. 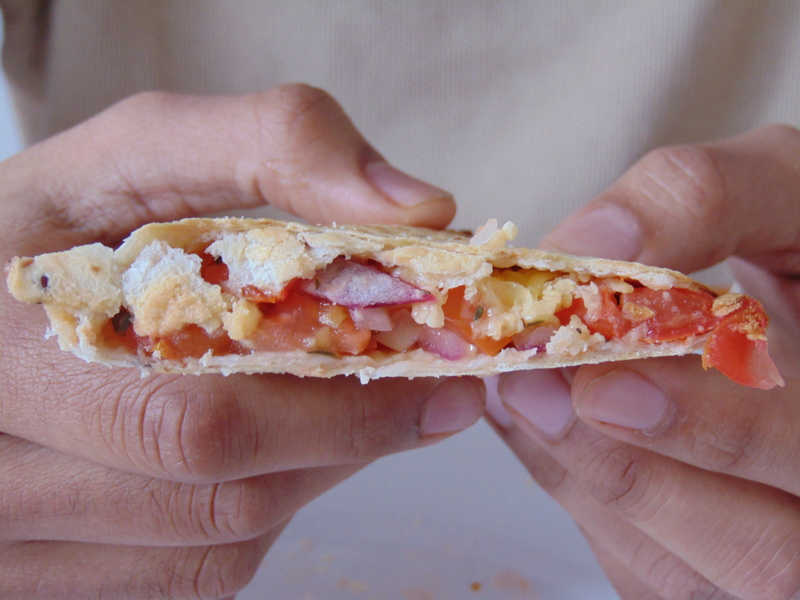 It was my first time making ‘cheesy dillos’, as my dear Dr HH calls them, and I think I was a bit too light on the filling. It was a really quick and easy weekend lunch, and one I will call on again, though I might liven it up. Maybe some olives? 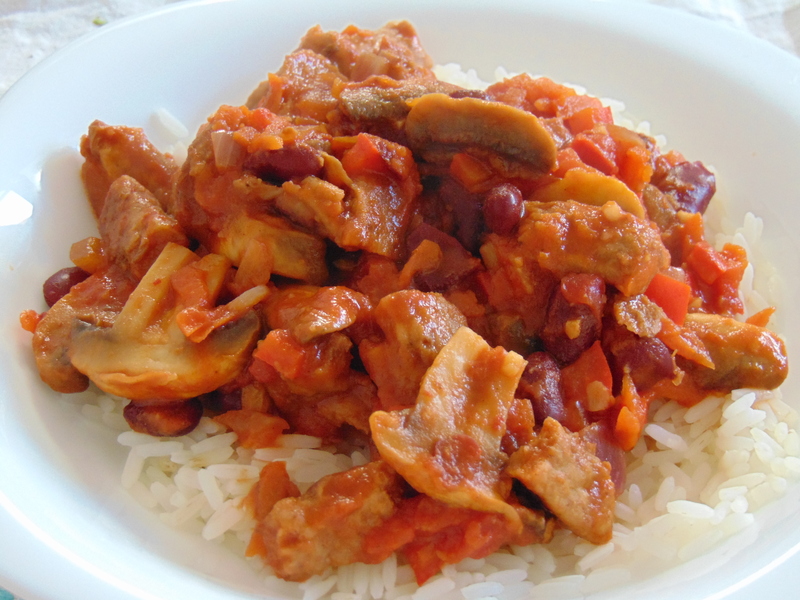 In the mains section I was pleased to find that there was plenty of variety in the recipes – we weren’t just eating different variations on chilli for the whole month. 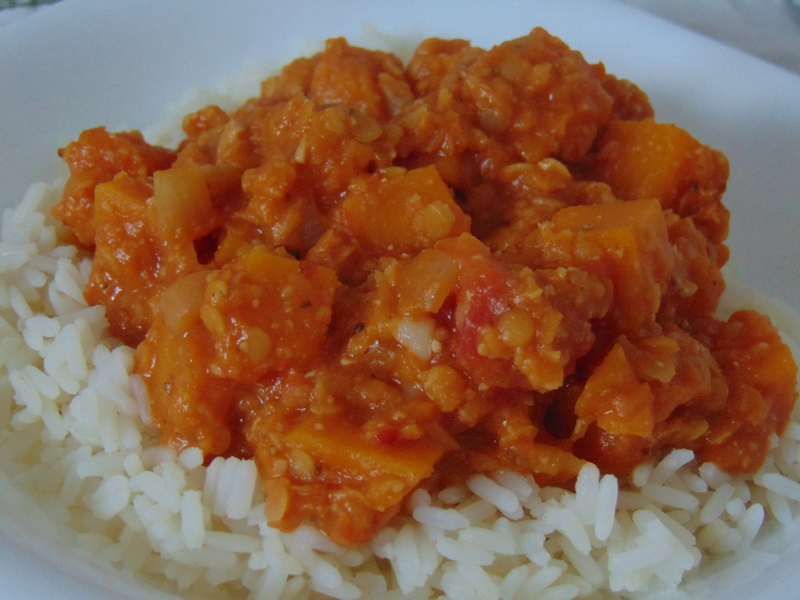 This peanut, lentil and squash stew was a fine example of that, and something I hadn’t really been expecting from Mexican cuisine. It was hearty and well seasoned. 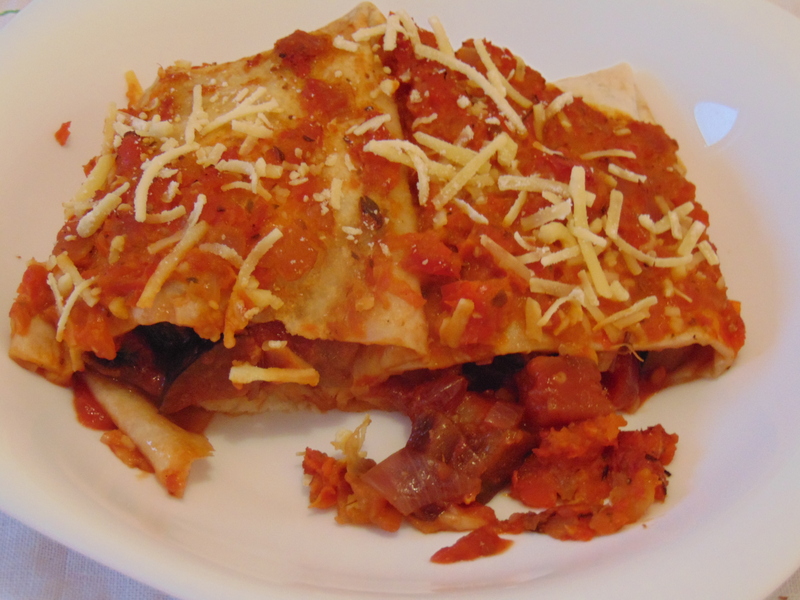 The first recipe I tried from the book was the aubergine enchiladas with red pepper sauce. This was simple and effective: the aubergine chunks were good and meaty, and the red pepper sauce on top was quite an unusual addition for me – usually when I make enchiladas, the sauce for the filling is the same as the sauce on top, so it was a treat to have the two different, distinctive flavours. I’m a fan! 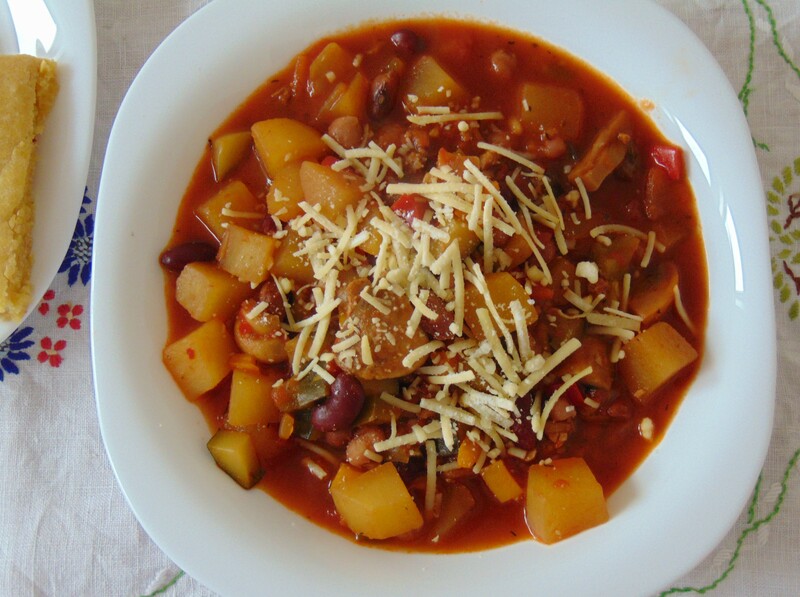 As this is a Mexican book, of course I had to try the vegetable chilli recipe. I was looking for some mock mince to use in it, but had to settle for meaty strips instead, which turned out really nicely. It was a really flavoursome chilli, definitely recommended. 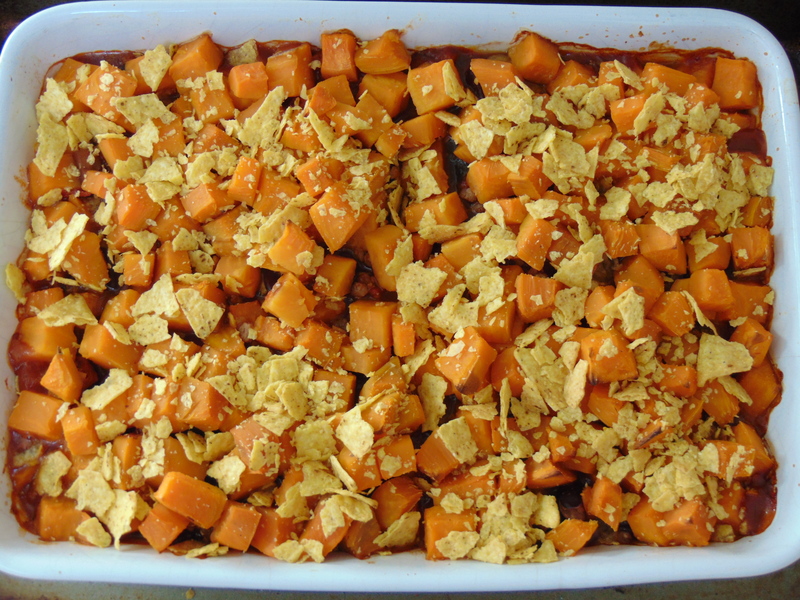 This aubergine and sweet potato casserole looked really inviting, with the vivid orange sweet potato layer. And it tasted really great too – there’s some mince in there along with all the aubergine. Dr HH said he would have preferred the tortilla chips served on the side for dipping, rather than letting them get soggy on top, and I can definitely see his point. I was really excited about trying the spicy pecan balls in tomato sauce (though I was surprised to find pecans in so many recipes). I made the mixture around lunch time, chilled it for a couple of hours, shaped it and chilled it some more, and the meatballs mostly held their shape. 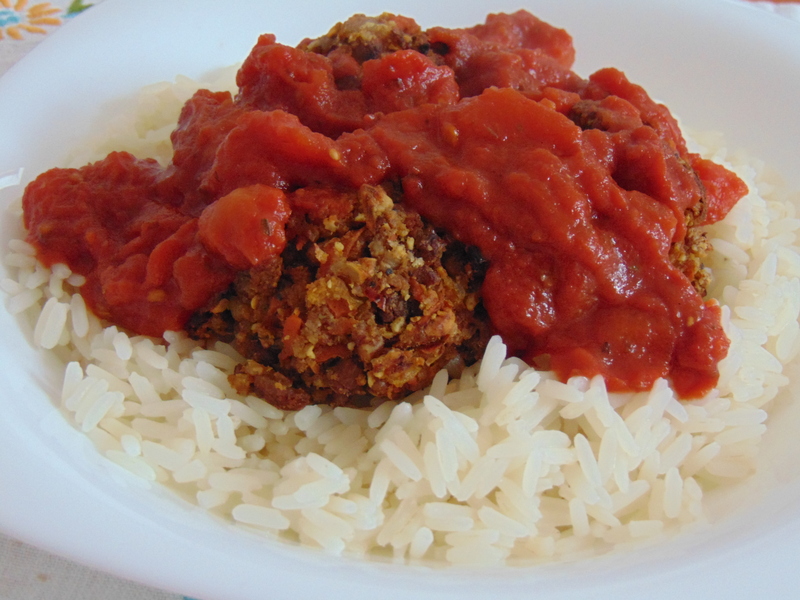 They were really spicy and meaty, and were good with a simple tomato sauce and rice. 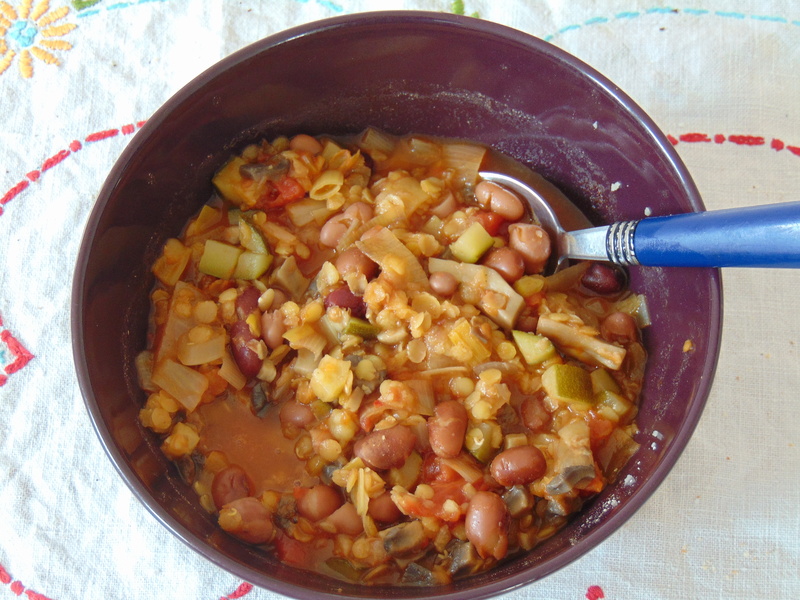 I made this mixed vegetable and bean hotpot while I was suffering from a bad cough and sore throat, and just looking at all this veg immediately made me feel healthier! It had a bit of everything: potato, mushrooms, veg, beans, cheese…I really enjoyed it. 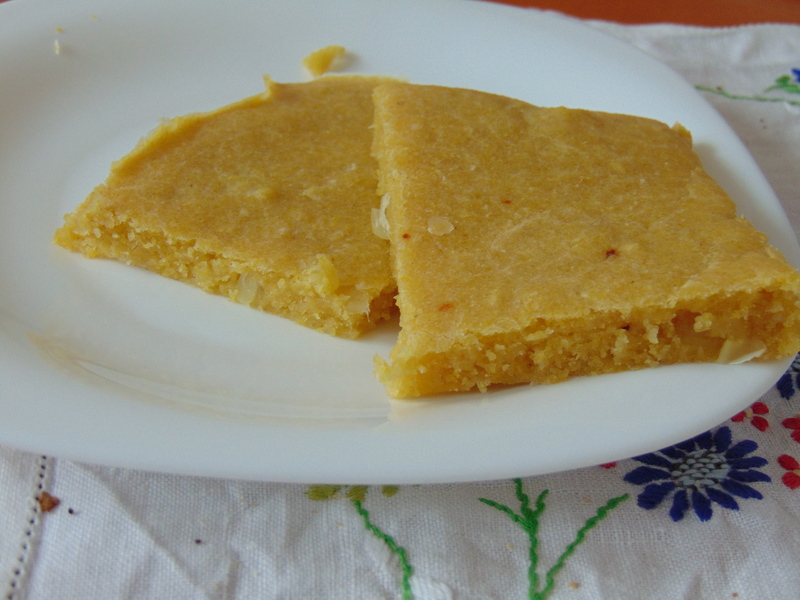 And I served it with some cornbread, which I’d never made before. I encountered two problems, both of which were my fault rather than the recipe’s. 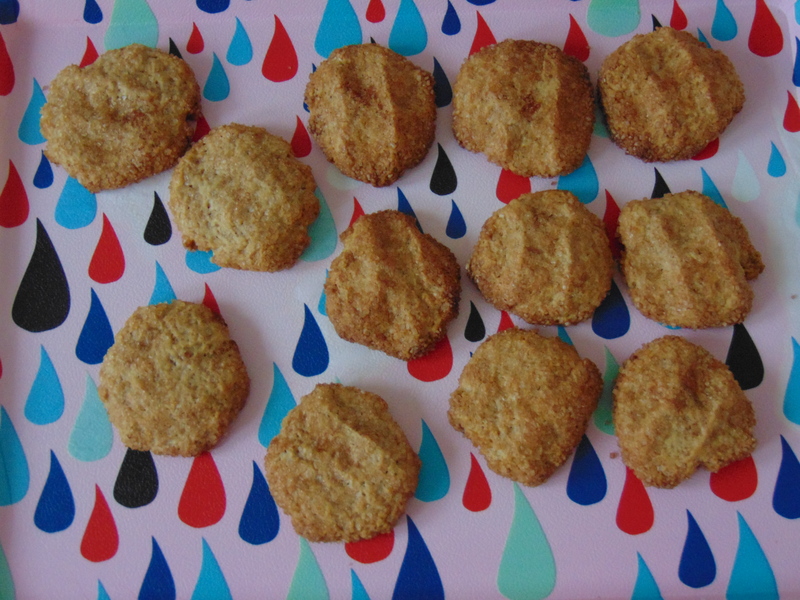 1) Just as I was popping it in the oven, I realised that I had just used plain flour without adding a raising agent (the recipe called for self-raising flour, but I just wasn’t thinking). 2) I only have one oven-proof dish and it’s very big, so the mixture only thinly covered the base. Put these two things together, and you can see why the end product is so flat. Still, it had a nice spongy texture and was really nice, so I’d definitely try this again and pay more attention! As I love a good breakfast and there are no breakfast recipes in this book, I was on the lookout for something I could adapt from the dessert section (of course). 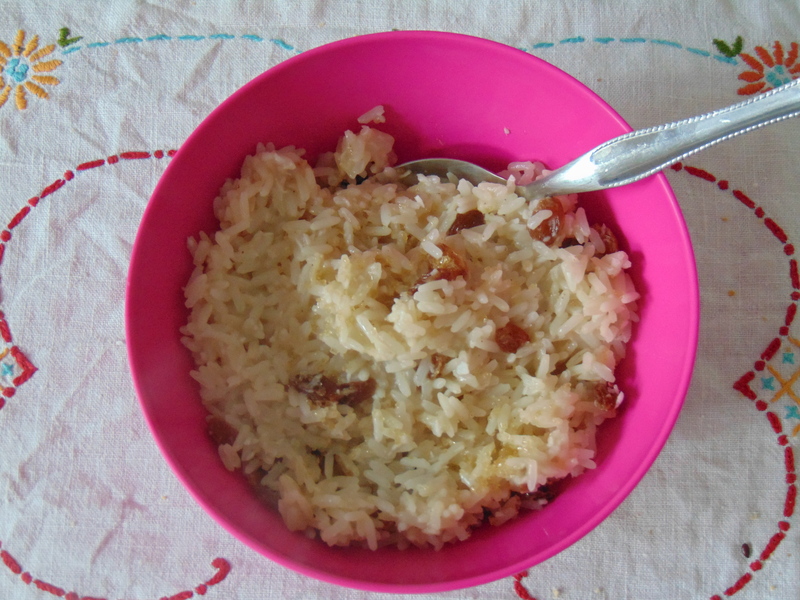 I decided to try the coconut rice pudding first thing in the morning, and I’d recommend it as a breakfast. It was nice, especially the juicy sweetness from the raisins, but I’ve got a creamier recipe for this already up my sleeve and won’t be switching allegiance any time soon. 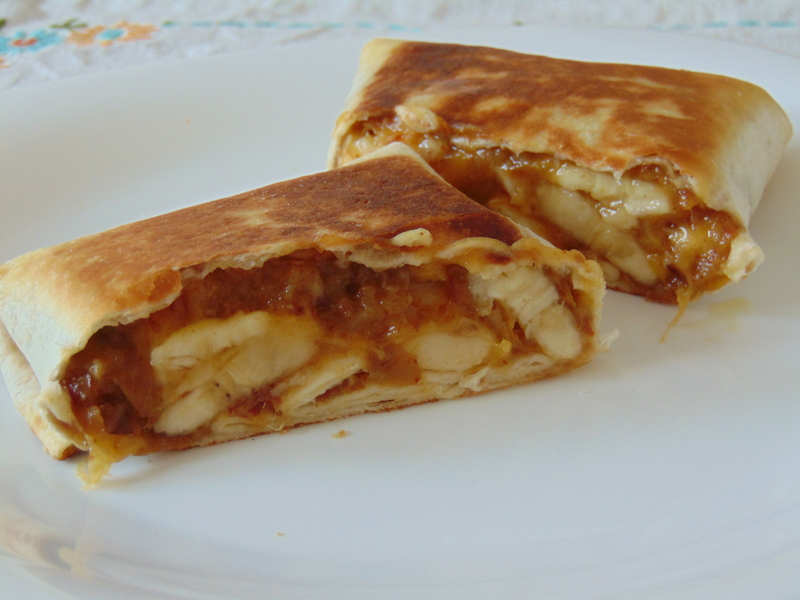 The banana and date chimichangas also got the breakfast treatment. What a success! I soaked the dates overnight because I always find the dates here to be rock hard. They formed a lovely caramelly mush, which was just perfect. I was quite worried about the wraps falling apart while I was frying them, but it was surprisingly easy. I used the full amount of filling ingredients, but only made two chimichangas, and I think this worked out about right, so maybe scale up if you want four. 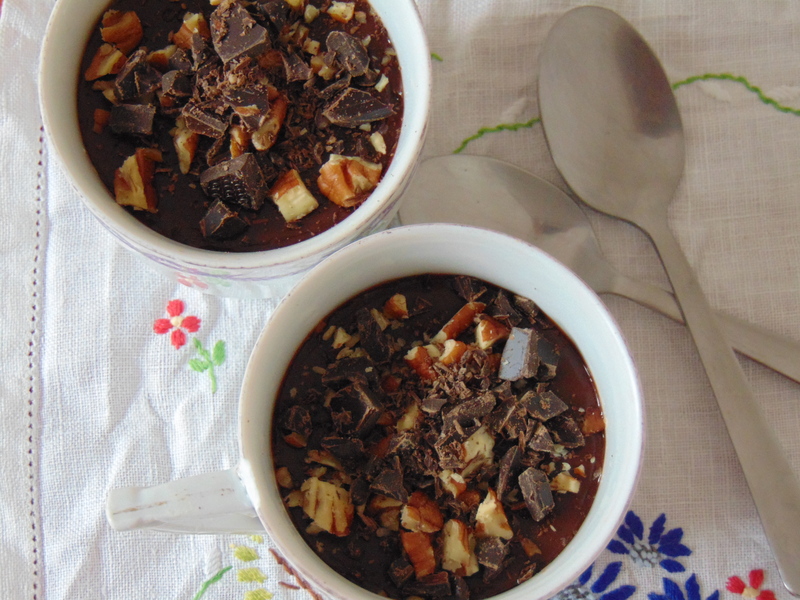 Mmm, chocolate and pecan pots! This is a dessert recipe that I didn’t turn into breakfast food. The recipe suggests making these in a bain marie, but this proved impossible for me: the mixture didn’t get hot enough to boil and thicken. When I put the milky mixture directly in a pan, it worked a treat. The pudding itself is similar to those little Alpro chocolate puddings, which was nice. I’d add a bit of chilli next time to make it stand out a bit more! I made the wedding cakes without even googling what they were supposed to look like, so I was worried when mine turned out to look not fancy at all. Fortunately they were still tasty – quite plain, but I liked how crunchy they were. I preferred the more exciting cinnamon crunchies. Fans of snacking on raw dough whilst working should note that the dough itself isn’t that sweet – but once it’s rolled in sugar and baked, they’re absolutely perfect! 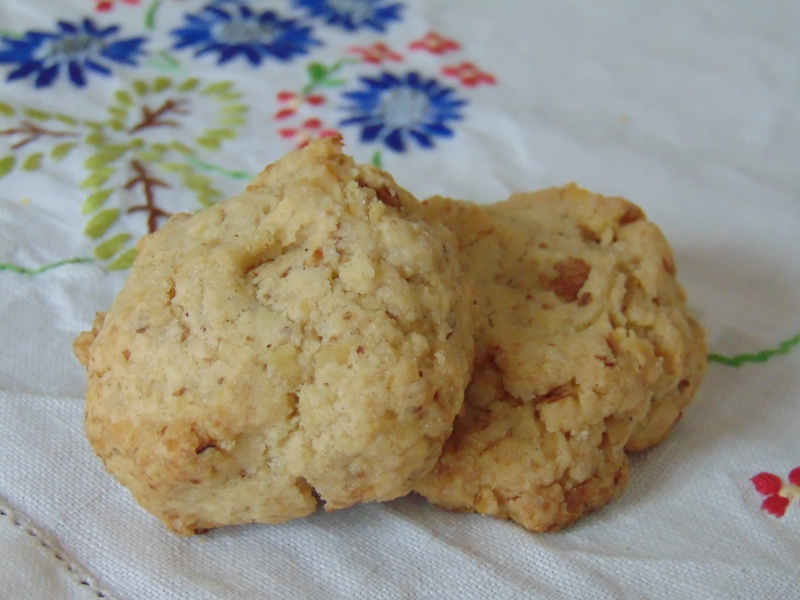 This is a nice simple recipe that didn’t take much time, so I’d definitely make these cookies again. And finally, from the drinks section I gave the hot chocolate a whirl. It was my first time making it from melted chocolate, and it was quite the little indulgence. I loved it! The vanilla and cinnamon really enhanced it too. As I said at the start, I’m a fan of these books and would recommend them. There were so many more recipes that I didn’t have chance to try, I could probably cook from this book for a second month without any problems. It has both quantity and quality, so don’t let the lack of pictures put you off! 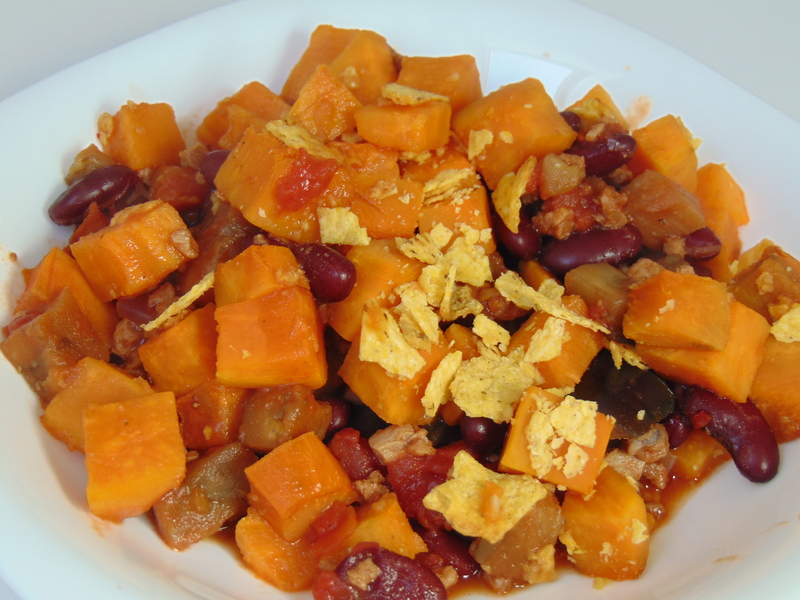 This entry was posted in Cookbooks and tagged A Vegan Taste of Mexico review, vegan cookbook, vegan cookbook review. Bookmark the permalink. A lovely thorough post as always. It seems like budget friendly grub too. I love rice pudding for breakfast especially Mexican style. 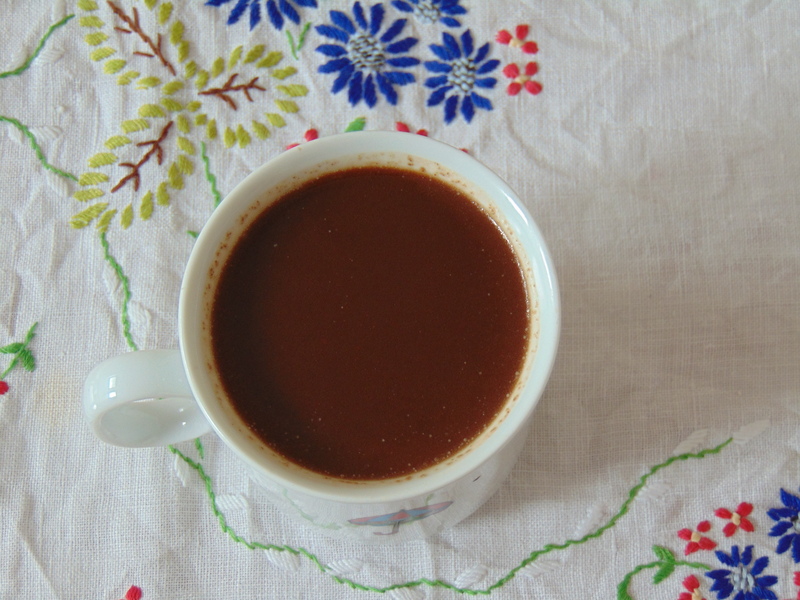 I went to Mexico years ago and brought back tons of the hard discs of chocolate infused with cinammon that you grind up in a pestle to make hot chocolate, so delicious. Oooh, they sound delicious! It is definitely budget friendly, lots of fresh veg, beans and grains. Some of the Amazon reviews complain that the recipes call for shop-bought cheese, and I think that’s the only really expensive ingredient. Except for avocados, of course! One thing I do notice about these books is she often calls for things I don’t fancy doing, like grating nuts. I have never grated a nut in my life (nutmeg, maybe) and I didnt know people even did! But they are great books, if a bit difficult to navigate! The avocado soup looks interesting. I certainly would have just skipped by that as I can’t imagine avocado in a soup! Actually, when I got to the wedding cakes recipe I decided I would grate the nuts as instructed. I grated one walnut half, saw that the end result was basically the same as pulsing them in the food processor, and decided to just stick with that! Whoever heard of grating nuts?! I have a number of books by Linda Majzlik, (not this one) can’t recall top of my head if I have cooked from them though. I find them like a zine but without the pictures which does not bother me. I am super impressed with how much you have cooked from them and the results, all homely and humbling food. Zine-like is a good description for them – let me know if there’s any particular one you’d recommend!